Destiny: The Taken King’s Year 2 season of opener of Iron Banner is about to come to a close. After reaching Rank 5 with all three of my characters, I can finally review whether or not Nirwen’s Mercy is worth the grind. Today is the last day that you are able to pick up this legendary pulse rifle from Lord Saladin. Pulse rifles are in a great place in the current meta, they win most encounters are short to medium range. They get beat out by scout rifles and snipers in long range encounters, but if you manage your map position well, pulse rifles are a great go to weapon. Get ready to enter the crucible and win some matches if you hope to obtain this gun. 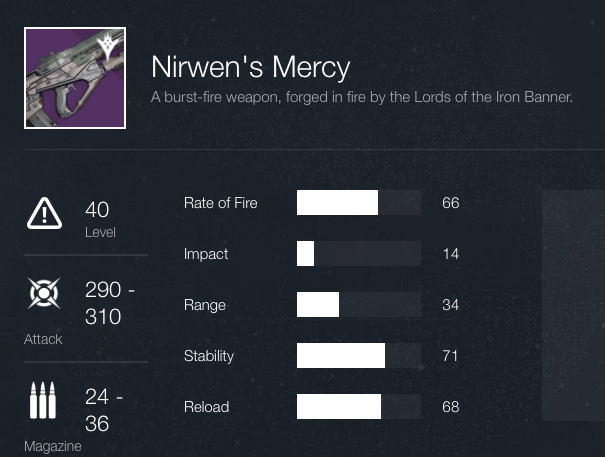 Nirwen’s Mercy is a Legendary Pulse Rifle that can only be obtained from Lord Saladin in exchange for 90 Legendary Marks or as a random drop from the Iron Banner playlist. The version that Lord Saladin sells has an incredibly good roll on it, which makes this gun a must own for any serious pvp player. You can check out the full list of perks on Bungie’s Armory. The stats almost match Red Death in terms of Rate of Fire and Impact. However, this gun shines in stability. Lord Saladin’s sells the gun with the following perks. I prefer the Red Dot OAS because of its wide field of view. The Ranged Lens is good for pve encounters, but the gun doesn’t have a great burst for taking down long range opponents, so I stayed away from the ranged lens. Both of these perks feel very nice in the crucible. Third eye allows you to check the radar even when aiming down sights, which helps keep map awareness high. Outlaw increases reload speed. I also wear arms that increase reload speed on pulse rifles so I have maximum time shooting. The focus on increasing stability is a very welcome addition to this gun. Braced Frame maximizes stability and with Outlaw increasing reload speed there is no reason not to pick it. The only negative to Braced Frame a reduced magazine size: from 33 to 27. Overall this gun handles great. It still gets beat going head to head against long range sniper rifles, the Hung Jury and the Bad Juju. It holds its own relatively well against Red Death, although Red Death’s high caliber rounds hit really hard and force you to keep the sights on target. If you happen to get a random drop of Nirwen’s Mercy from Iron Banner look for Glass Half Full matched with Life Support or Rangefinder. Glass Half Full will really help the damage output of this gun, and Rangefinder will pair well with the stability. Life Support will make this gun a legendary version of Red Death. My recommendation is that this gun is well worth the 90 Legendary Marks, we all know that the drop rate has been poor during this season of Iron Banner; however, this gun should make the rounds as a random drop when Iron Banner returns. Don’t forget to look for some of those great rolls.